Ultrasonic level transmitters are sensors with an electrical transmission output. Explosion-proof, remote sensor, and cellular models available. Applications include process tanks, chemical processing, and water & wastewater. Ultrasonic technology with temperature compensation provide accurate and reliable measurements. Ultrasonic Level Transmitter provides reliable, accurate, non-contact measurement of liquid levels. No moving parts. A few applications include water and wastewater, chemical processing, food and beverage. Ultrasonic Level Transmitter - Mobile- Ideal for managing fuel tanks at remote sites. Fit for harsh weather conditions and installation is simple in a variety of locations. Ultrasonic Level Sensor provides non-contact, ultrasonic level measurement of fluids for short range applications. Applications are pulp & paper processing, sump & process tanks, and chemical processing. Ultrasonic Level Sensor provides non-contact, continuous ultrasonic level measurement of fluids for medium range applications. Pairs with automatic temperature compensation. 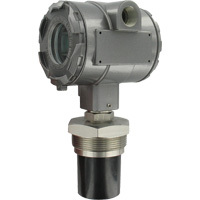 Ultrasonic Level Sensor provides non-contact. continuous ultrasonic level measurement of fluids for short range applications. A few applications are water and wastewater, sump and process tanks, and chemical processing.